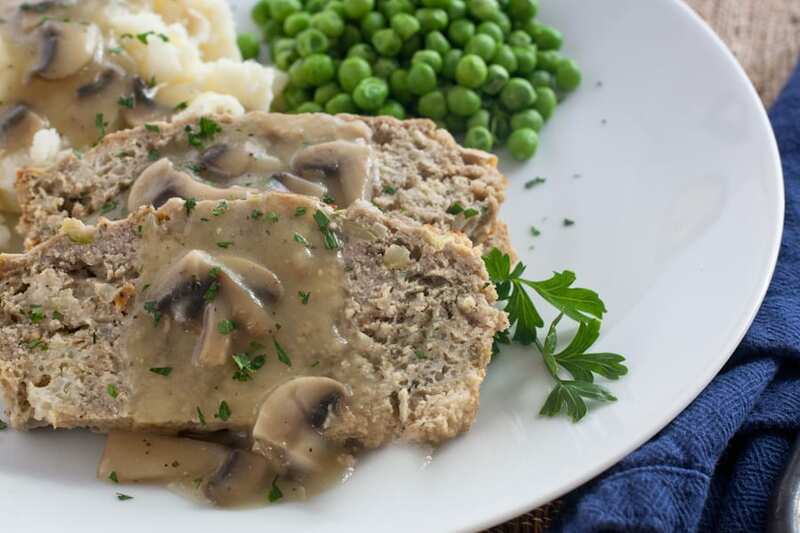 Gluten free turkey meatloaf with mushroom gravy. My mom never made meatloaf when I was growing up, so the first time I ever had this was in my late 20’s. It’s so delicious, I generally make a double batch because the first one is inhaled by the family and I do like to “cook once, eat twice”! It’s a great budget dish too, as a pound and a half of ground meat will serve 4-6. I pump up the flavor in both the meatloaf and gravy with a bouillon paste, like this one. The “secret” ingredient, club soda makes it vey light and fluffy. A pound and a half of ground turkey makes enough meatloaf to serve 4 to 6. Use your favorite gluten free bread to make the bread cubes. I save the small bits and the heals in the freezer for just this sort of recipe. 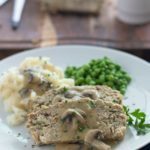 My family likes this meatloaf with mushroom gravy and mashed potatoes. 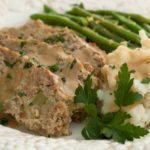 This gluten free turkey meatloaf is a hearty and healthy dish, sure to please the pickiest of eaters. Put bread cubes on a baking sheet and toast in oven until golden and crisp, about 10 minutes. In a saute pan, heat oil. Add chopped onion and celery and cook 2-3 minutes, until translucent. Add garlic and cook and additional minute, just until fragrant. Remove from heat. In a large bowl, combine ground turkey, toasted bread cubes, eggs, sauteed vegetables, spices and club soda. Combine. (I use my hands). Fill a lightly greased 9"x6" loaf pan with meatloaf mixture. Do not pack. Bake at 350 degrees F. for 1 hour to 1 hour and 15 minutes. Meatloaf should be hot and bubbly. Let stand 15 minutes for juices to set. If you’re looking for other ways to change up your pound of ground meat, how about Chinese Lettuce Wraps or Indian Samosas? Here are some of the items used in this post for your convenience at no additional cost. 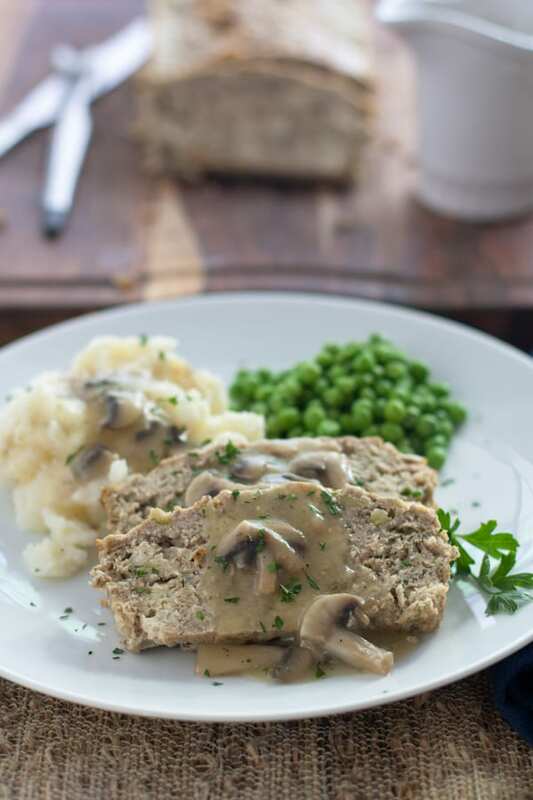 I hope your family enjoys this gluten free Turkey Meatloaf as much as we do! As a rule, I abhor meatloaf. I don’t know where I had it, but it was like eating a roof shingle. My mother made an Italian meatloaf once, with dry cured italian sausage through the center and it was delicious, but for some reason she (nor I) ever made it again! Your meatloaf looks totally different than those dry “ketchup filled” bricks. I’m sure I’d love this version, especially with the mushroom gravy! YUM!! 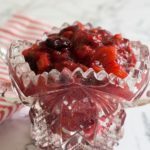 You know how I feel about ketchup…that’s why I love this recipe! 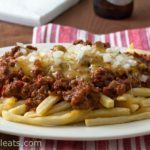 I love this recipe, I’m going to have my hubby try this with low carb bread crumbs – we’re always looking for new dinners to make that are low carb. I just save up bits of our GF bread heels. 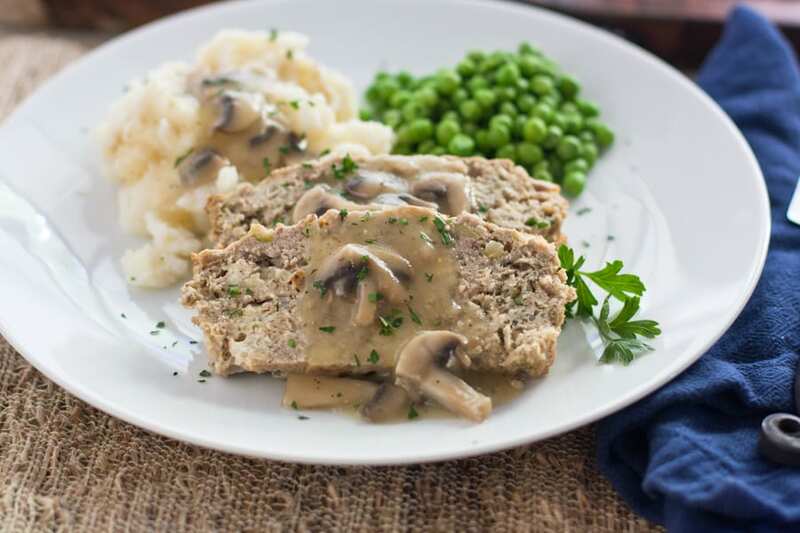 This turkey meatloaf sounds incredible! And the mushroom gravy is the best idea ever! Yummy! Yummy! This looks great and I have never considered making gluten free meatloaf. I have got to try this soon! good point Zouhair. The ground turkey here in the states has some fat in in. Ground lamb is not as readily available and is much more expensive. I’ll have to give this idea to my mom! Her and my dad both really like turkey and we always have leftovers after Thanksgivng! 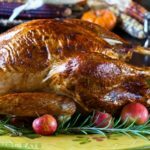 this calls for ground turkey, which is available year round too! Did you say you use club soda in the recipe? I didn’t see it on the list, but I’m really curious how you use it! I like meatloaf because everyone loves it! 1/2 cup plain club soda. I’ve amended the recipe. Your instructions show club soda bit it is not listed in your ingredients. Can you please tell me how much to add to the mixture? Thanks for catching that! 1/2 cup plain club soda! I’ve amended the recipe card. I could not find a baking time for this recipe. sorry deb! It’s 1 hour to 1 hour 15 minutes. Check to see that it’s hot and bubbly. I just went back and checked the instructions. It looks like the last part of the instructions got cut off. I fixed it. Thanks!